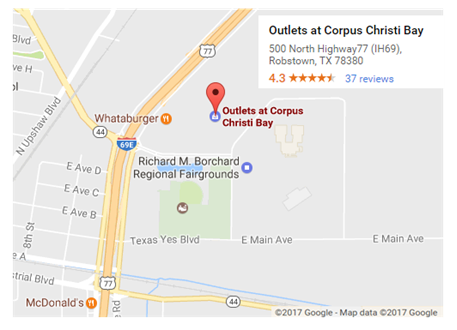 ROBSTOWN – Lots of shoppers are heading to the new $70 million Outlets at Corpus Christi Bay​. Located at I-69 and SH 44 in Robstown, the new outlet mall offers 325,000 sf of retail space. The first phase has about 25 stores operating at the location and officials hope to have 75 to fill out the available store sites. ​The retail mall is the largest development for Robstown since the Richard M. Borchard Regional Fairgrounds opened next door in 2007. Stores at the Robstown site include Amish Furniture of South Texas, Francesca’s, GNC, H&M, Kitchen Collection, Maurices, Rack Room Shoes and Sunglass Corner. A planned second phase of the Robstown outlet mall will add an additional 150,000 sf of store space. Lockard Construction is developing the outlet mall in Robstown.